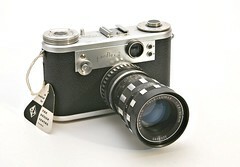 The Periflex is a 35mm camera manufactured by K.G. Corfield Ltd, England. It employs a 1/30 to 1/1000 sec. and B focal plane shutter and has the standard 39mm screw mount. It is a very basic camera. The body and removable back are metal castings, while the top and base plates are of stamped black anodised aluminium with delicate engravings. The shutter crate is a separate casting with a built-in rangefinder, arranged as an inverted periscope manually lowered into the light path behind the lens for focusing on a fraction of the image area. At the top-plate, four bright aluminium knobs make up the controls, complemented by a circular accessory-shoe mounted optical viewfinder. 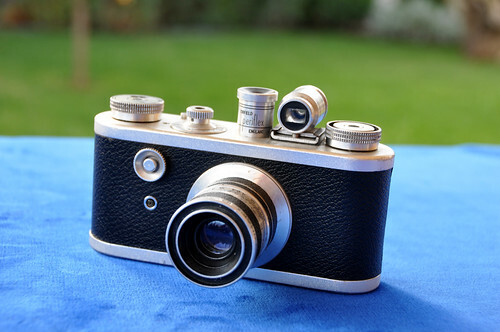 In the late nineteen forties, the British camera industry had outdated designs, lack of investment, and it failed to recognise the market needs. The devastations during World War Two, and the austerity that followed made the situation even worse. However, the government implemented import restrictions on luxury goods at the time brought about opportunities and opened for creativity. The prime of the British camera industry had long since fallen apart. - Kenneth Corfield, born in 1924, was a creative man in his early twenties who saw these opportunities. He had particular interests in chemistry and physics, as well as in photography. Lacking money for equipment, he made some of it himself. Soon he began manufacture for sale, and within a few years, in 1950, he and his younger brother John, established the K. G. Corfield Ltd. in Wolverhampton. The main products were the Lumimeter and the Telemeter. However, he was fascinated by the miniature 35mm format, and there were a healthy demand for affordable 39mm screw-mount cameras. 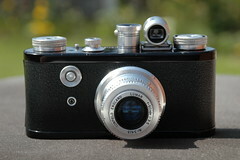 He began developing a 35mm camera, and the presentation of it coincided with the event of the Queen's coronation in 1953. This was the Periflex. The wind- and rewind-knobs are at their familiar places. The anticlockwise film-only advance knob has a frame counter in it, visible through an opening in the knob. Next to it is the tiny rewind button. To reset the frame counter, depress and hold down the rewind button and wriggle the wind knob while observing the frame counter dial rotate, until the zero number appears. The back opening knob at the base is best operated using a piece of sharp plastic to rotate it either way until it feels slack and the back is loose, then slide it off downwards. Load the film in the normal way, and wind on a bit while using the rewind release button, then replace the back. Next two frames must be wound to reach unexposed film. Wind the shutter using the small serrated knob on top of the shutter-speed dial until it catches and doesn't return. Advance the film one frame, turning the wind-on knob until it stops. Lift and turn the shutter speed dial either way until the index dot is next to the required number. Expose a frame by depressing the shutter release at the front of the camera. 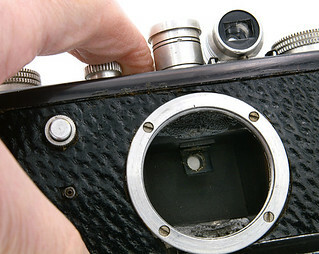 It is quite awkward tensioning the shutter by turning the small knob against the rather stiff shutter spring. It does not matter in which order the film and the shutter are wound. Both must be operated before the shutter may be released. 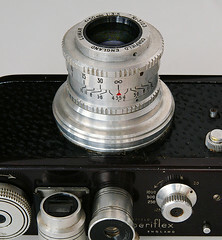 The periscope focusing assist mechanism is operated by depressing a button protruding from the side of the vertical cylinder housing to lower a periscope into position behind the lens, while looking down in it and focus the lens. It works like a reflex finder, but is shows only a small part of the image. The frame is composed using the top mounted optical finder. 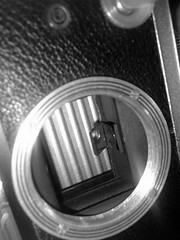 It should be noted that it is unlikely that the shutter still works properly, and even if so, it is a challenge to operate this camera successfully. Return the film to the cassette when fully exposed by turning the rewind knob clockwise, while depressing the small rewind release. Make sure it is fully returned before opening the back. 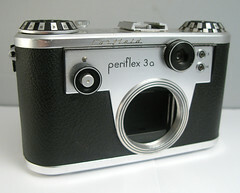 The Periflex was sold with a Corfield England Lumar f=50mm 1:3.5 standard lens in a bright aluminium barrel. Corfield had the British Optical Lens Company calculate the lens and they also manufactured the glass elements, while Corfield made the barrels, mounted the glasses, and completed the high quality coated lens in their premises. The original Periflex body was all black metal castings with top and base plates black anodised aluminium. The first few hundred were covered in brown pig skin, which proved to be difficult to mount in production without getting glue stains on it, and soon complaints from customers was reported to the same effect regarding stains. This resulted in changing to black leather in production, and a camera returned to the factory was changed to black leather, if the customer so wished. After about one and a half year manufacture, the top and base plate were changed to bright aluminium finish. All later standard models were finished in bright aluminium and black leather too. 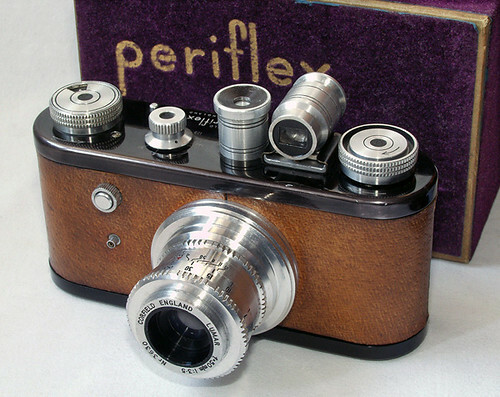 The Periflex was replaced in 1957 by largely reworked Periflex 3 in 1957 and a year later complemented by an economy model Corfield 2, both with the finder built in. John E. Lewis (1985), It's by Corfield. It must be good. The Periflex Story, p. 29-31, 93. Sir Kenneth Corfield, 'Recollections' in Photographica World no. 71, December 1994, pp. 15-20. 'New Apparatus and Materials' in British Journal of Photography, 18 May 1956, pp. 239-240. This page was last edited on 19 February 2018, at 03:10.